Currently in America, the average debt is $67,900. This debt does include mortgage debt, which isn’t an uncommon debt to have. While it is common, my family and I are currently on a mission to erase all debt, including our mortgage from our lives. If you follow Dave Ramsey’s Baby Steps you know that the first step in debt payoff is saving $1,000 into an emergency fund. So if you are beginning your debt payoff journey, how do you save up that $1,000 and fast? I have got 12 practical ways to get you started building your emergency fund. Yup, I am officially a Dave Ramsey gazelle and it is awesome. In his course, Financial Peace University, Dave Ramsey talks about how gazelles are actually slower than cheetahs, yet they are able to outrun and outsmart cheetahs (I believe) 99% of the time. This is how you need to think about getting out of debt and building a savings. Be willing to do whatever it takes! Making money doesn’t have to be as hard or as stressful as you may have previously imagined it to be. In fact, on top of this post check out this 29 Easy Ways to Make Money post for additional, practical ways to make some additional cash. This post is literally laid out to specifically get you to $1,000 saved up in your emergency fund as quickly as possible. Trust me, I know debt payoff can seem crazy overwhelming but I promise you, it doesn’t have to be! When getting started saving money, the smartest step is to look at your current spending habits. Chances are, if you have been struggling with money for years it’s because you are wasting some somewhere. There are simple solutions and substitutes you can make like taking faster showers or setting your thermostat higher in the summer and lower in the winter. But, did you know that you that there are companies that will maybe even pay you to reduce your energy use? OhmConnect will get specific with telling you when the best times are to save on energy and in some states even pay you for participating! Not sure what else you can do to save money? Try the Trim app! Trim will analyze your spending and instantly makes suggestions on different bills you have that you could be paying less for. We signed up for Trim and within 20 minutes I was told that I could be saving over $20 on my internet bill and that they would take care of everything for me! An extra $89 per month!? Last but not least, let’s talk about that cable bill! The average monthly cost for cable is $99 compared to a $10 Netflix subscription. You could even invest in a digital antennae so you can still pick up local channels and sports games. The best part about cutting cable is that you could not only be saving $89 once but every single month! If you are a big gym goer like myself this one probably makes you flinch! I know it makes me nervous just thinking about it! But ask yourself how bad you want to start saving and use that as incentive. Considering that the average gym membership is around $70 per month, this could be a huge savings. We were paying $125 for a family membership!! Talk about expensive. There are so many alternatives to high priced gym memberships, especially if you’re paying the $215 for a family like we were. I can’t tell you the amount of times we used to go over our budget and little purchases were to blame. There would be $10 for coffee here, $3 for a quick snack there, $7 at Taco Bell, $12 at the liquor store… Let me tell you, those purchases add up fast. Because of this, a great rule to have is to not spend money on anything less than $20. I’m not saying you should aim for $20 at Taco Bell instead of $7, but rather don’t bother making small, useless purchases because they can end up costing you your well balance budget. If I’m being generous, I would say cutting small, useless purchases can easily save you around $60 per month. Get a savings account set up and then begin automatic payments of and aim for at least $100 and then don’t touch it! Ideally, you should be saving 10% of your paycheck. 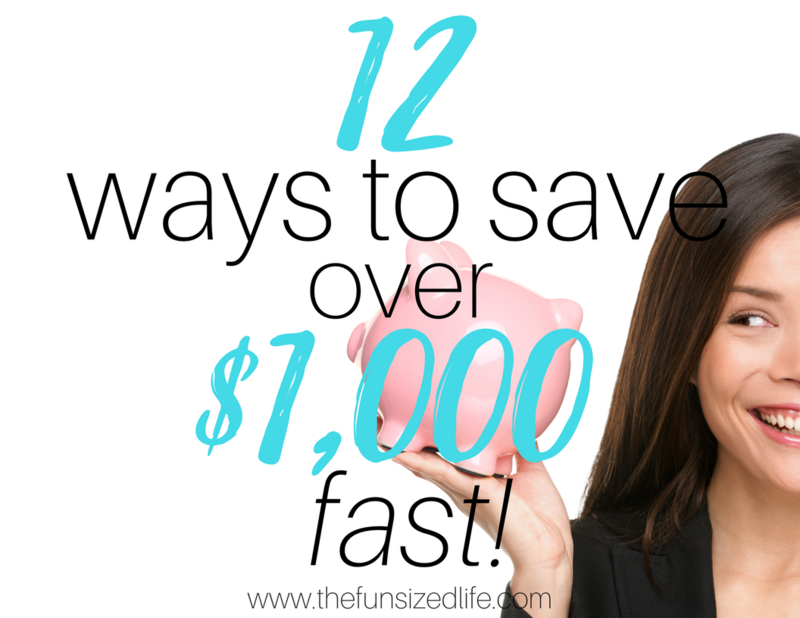 Start smaller if you have to but whatever you do to create a lasting habit of saving money. Most savings accounts are not paying you nearly enough in interest! Get the most for your money by opening a high yield or money market account! Again, if you consider yourself to be a clutter bug, then you are sitting pretty when it comes to this one! Places like Facebook Marketplace have made it crazy easy to start selling your stuff and fast! Last weekend I made $50 just by clearing out some things we no longer used. The average amount spent on lunch is about $12 for one person. If you have made a habit of getting lunch every day of the week (and let’s face it, probably weekends too) then you are spending about $240 a month on one daily meal. Now is the time to get an affordable meal plan together and start saving big time. In fact, if you consider each made from home meal costing around $3, you have a difference of $180 per month! If you are not great with planning healthy and/or affordable meals, then let someone else do it for you! Check out The $5 Meal Plan where a busy mother of 4 has already prepared budget friendly meals and grocery lists for you! Finding a way for an additional $200 or more income has always been rather easy for me. I have worked at preschools, YMCA, taught dance, yoga you name it to make a little extra cash. Thankfully, with the wonderful world of technology it’s getting easier to use technology to your advantage when it comes to scoring a side hustle. Here are some of the best quick-start options for making a little extra money on the side. Education First – Teach English online to children or adults! Rover dog sitting – Get paid to walk, watch or visit dogs! This app will let people find you fast! Uber – Become a driver with Uber. Earn when you want, chill when you want. UberEATS – Deliver food instead of people. Different banks have different perks when it comes to opening a new savings account and some of them even reward you with money! These can pay off huge, with some offering incentives up to $500! Of course, bonuses that high often require you to have certain balance over a certain period of time. Most places are starting their offers around $100. Shop around and see if you can find a local bank in your area or online that might offer additional savings just by opening an account! The best way to save on purchases you already make is by taking advantage of different coupon and discount apps. You can save on everyday purchases, but the best part is, you will get money just for signing up! BeFrugal – Get $10 for signing up! Dosh – Get $5 for signing up + money for each additional card! Drop – Earn $3 for every card you link! Ebates – Get $10 for signing up! Ibotta – Get $10 for signing up! Even if you only take a moment to sign up for these apps and then take advantage of their awesome saving services, you will have an additional $38 in your pocket! Well, we’re a dollar away from our goal. So I could easily just stop right here, but I know there are way too many veriables in life, so just to make sure you’re covered, let’s continue on! I know, I know we just did savings apps. So I guess I’ll just get specific: Target savings apps! If you are shopping at Target you should definitely be taking advantage of their sales and coupons that they offer in their Cartwheel app. On top of that, by signing up for a Target debit or credit card you save 5% on each purchase you make! That means if you spend $100 on groceries, you get $5 back! That might not seem like a lot, but every little bit adds up. Plus, throw in a few 30% offs and you’ve made yourself a hefty savings! Don’t worry, Target’s debit card links up to your regular checking account and works like any other debit card, except it keeps a little extra cash in your pocket! Another great way to get more money out of your shopping trip is to sign up for National Consumer Panel. All you are required to do is scan your barcodes after you’ve purchased something and National Consumer Panel will pay you for sharing your purchases with them! This helps them get a good idea of what consumers want more of and helps get you some extra cash in your pocket. Honey is a quick app that you can add right to the desktop of your computer. Whenever I start shopping online, Honey will alert me of potential savings and then instantly applies the coupon codes I need to save! We have all heard of that good ‘ol fashioned mowing your neighbor’s lawn gig. Again, thanks to technology, you can help way more neighbors and you don’t have to go door to door! Now there are places like TaskRabbit that allow you to link up with others in your area and get paid for helping them do things they might not be able to do themselves. This might mean moving, mounting a TV to the wall or doing yard work! If you have come to accept that your car is simply a vehicle to get you from point A to point B, maybe it’s time to make some money of one of the fastest depreciating things you own! Advertisers pay an average of $400 to slap their adds on your back window! If you are ready to make super easy, fast cash this is definitely something to look into! Of all the things I have written here, this one is the most crucial. If you have debt, I don’t have to tell you how much it can weigh you down. I’m also not going to pretend that paying off debt is easy, but it is worth it. Tom and I attacked our debt with everything we had a little over a year ago and were able to pay off $6,000 of debt in only six month. See how we did it here. After leaving our big house, I also left my photography business. In order to pay off our debt, I was taking small, part time jobs while still homeschooling our kids. I turned down girls nights with friends, said no to vacations, stopped buying anything that we didn’t need and put all my energy into watching that debt disappear. In order to do this, you may definitely need to get some extra cash on hand. So get that $1,000 fund safe and secure and then keep making that moola to pay off any debts you might have! Thank you for your post. I had just started thinking about selling plasma. Also focusing on a goal will be crucial to sticking with a plan. Selling plasma isn’t something I’ve done but I know a ton of people who do! I mean…if you don’t mind and you can make some extra cash…may as well! Great post with lots of tips and resources! Having goals for your money is so important, otherwise, like you mention, it is so easy to lose track of where it is going. Paying down debt is definitely something my husband and I are working on, and I will be checking out the Brightpeak course and some of the other resources! Absolutely! I signed up for their $500 savings in one week plan and am already loving what I’m seeing. Just some more ideas I hadn’t thought of before! This is a brilliant post I`m reading just at the right time as I`m planning on reducing my working hours as from January.Now reducing my work hours does not mean I want to go without essentials, I just need to use my money wisely and this post is a real eye opener.Thanks so much for sharing. Absolutely! You can do this! I hope you enjoy the extra freedom! Same here! We currently have a stainless steel microwave…and that’s it. HAHA The extra $3,000 for matching appliances just didn’t seem necessary! Great tips! I didn’t know you could sell Plasma! I need to check out how that works! That is so awesome!! We are very close to being right there with you! I can’t wait! This is great and very insightful!! Although it is hard to go against the norm at times….LESS IS MORE! We need to instill this idea in our kids as well! The average debt stat you stated is amazing and living with that hanging over your head could/would cause so much anxiety! Thanks for sharing this post….word we should all be thinking about!!?? Thanks so much Emily! I’m hoping my kids learn this life lesson early!! Definitely! Thanks so much! It has been well worth the effort! Live below your means and cutting down expenses and creating budget by knowing what is going in and out which helps you plan your finance well. Thanks for this great insight. These are awesome tips! I attempt to keep track mentally but am always startled when I check my bank statements lol. I need to create a budget yesterday. Well, I hope you can get started and find major success! It’s truly life changing.